Sound preparation design is the cornerstone of solving complex cases. Recently I received a series of clinical photographs with a question, “What should I do to close the gingival embrasures?” It’s a common question and comes down to preparation design. 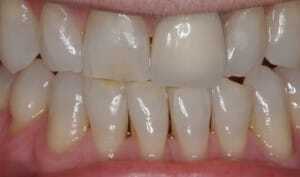 We close gingival embrasures (or try to) routinely with direct composite. You all know the routine, you place the composite, do some finishing and then it is time to check with an explorer and floss. Sure enough there is a catch at the gingival, so you get out the mosquito diamond or finishing bur and get to work. Several passes later with your explorer it feels as smooth as silk, you sit back and stare at an open gingival embrasure. Ok, maybe this has never happened to you, it happened to me and it is the same issue our technicians face. When preparing a veneer with the intention of closing an open gingival embrasure we need to place the margin as far into subgingival as we can without violating the biologic attachment. This same principle applies to placement of the margin of a composite when closing a diastema. In addition to proper gingival margin placement you need to prep through the contact and leave the margin on the lingual side of the contact with the adjacent tooth. What we find challenging in doing this type of prep is the amount of tooth structure being removed. Preparing the tooth to ensure the end result is achieved is conservative. Treating these teeth as veneers, even with subgingival margins and through the contacts is more conservative than full coverage. If you only have one embrasure to close, break that contact and leave the other interproximal margin facial to the contact.